The Doctor had pronounced me dead and God’s angels took me away from my home to Heaven where I found three important ladies- my Mother, my Granny & my Grandma, who were happy & sad to see me there. They were God’s favorite angels and God agreed to their request! 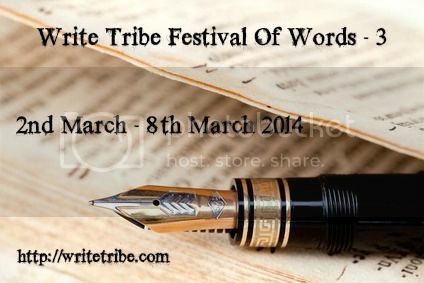 This is my Post for the IndiSpireTopic-2-#BackFromTheDead, Write Tribe - The Wednesday Prompt 2014 #8 & Write Tribe - Festival Of Words: 9-Sentence Fiction. Aaha ! A very very imaginative piece, Anita. Happy that she could come back. Happier that she knew all the lovely ladies in her life are happy in heaven :) Loved the way the ladies were concerned about their hubbies on earth :) :) Women are like that, aren't we ! Thanks Sreeja :) Delighted that you liked it! Yes, High-5! We women are always so concerned! And the three women I have mentioned were the epitome of caring & sharing. I know they are my Guardian Angels now. PS: I like the way you combined all three prompts, Anita. If it is really possible!!! Great imagination power you have! Very nice twist. Really back from the dead. It was all your mother and grandmothers' work, and the doctor got the credit! Writing on multiple prompts must be very challenging and would require great imagination, I believe. You handled it well! And your deep affection for the three ladies in your life shows up! True Saket! Good observation. Happens so many times. Some people hope & pray while others give us their blessings that saves us. Prayers & Blessings can save us! That's an excellent point, Indrani! God has His own plans. Such an interesting piece of writing! Great! Thank you for the appreciation, Swarnam :) Glad you liked it! 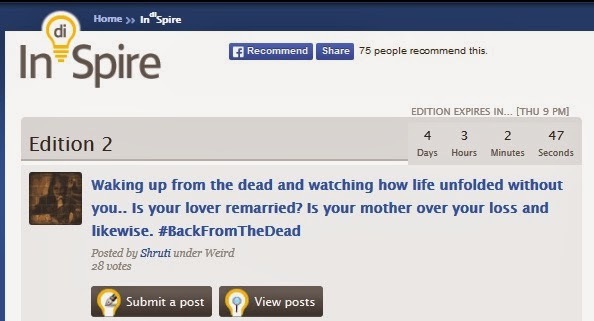 The bliss of coming back from the dead. I am guessing she felt incredibly happy. Nice one! Yes Shailaja! Happiness for everyone when the lady of the house is back from the dead! Yes! I read your creative post! It's cool thinking & positive attitude that can win over anyone- even God! Nice to be back on Planet Earth that too living in our own body! International Women's Day is round the corner! Thanks Sangeeta :) Yes, they were forever encouraging and loved my writings! That's one with a different take but enjoyable, Anita:) I believe in angels despite being agnostic. That was a nice post! glad that she came back to earth..
Did you combine the two prompts? Gooood! And it turned out to be a rather smart narrative.. Thanks Richa for your appreciation :) Delighted that you liked it! Well well just like your header says-miracles do happen!A refreshingly different story Anita.I enjoyed reading it. Thanks Induji :) Glad you enjoyed it! Thank you for stopping by & taking time out to share your view! Do visit often! Delighted you liked it! That's seriously awesome, you made a great post by correlating the prompts! You have done an excellent job with the prompt! Kudos! Thank you so much :) Delighted you liked it!